Call It Climate Crisis Not Climate Change Or Else? Another year has come and gone and the earth’s climate continues to become ever more extreme, violent and unpredictable. Yet every day, everywhere in the world, one hears politicians, industrialists, scientists, academicians, news anchor talking heads and protagonists or naysayers of all colors and shapes misuse the expression of so-called Climate Change to describe what is the actual reality of what is going on. Is it a sick joke or a cruel lie being perpetrated? Like the crash of angry waves against every shore on earth, the din is as constant and deafening as it is mind-numbing. Is the din being caused by out-of-control human activity and the world’s equally out-of-control modern civilization that only knows how to create excessively more and ever larger amounts of that which destroys everything in their wake: money, wealth, population, immigration and the limitless expansion of so much more that continue to be projected forward, pell-mell, into an unknown future? Or are the constant, ever more radical planetary changes everywhere occurring simply part of a natural, immutable, series of unending cycles of our mother the earth simply undergoing the many violent changes she has had to endure as have a gazillion other planetary bodies in the universe? Ralph Nader, former Green Party candidate for the office of the U.S. Presidency, recently again called all our attention to the sick and cruel use of the term “Climate Change”, so thoughtlessly flogged by too many pundits in denial, who forever seek to evade and avoid the inevitable Earth Island Dilemma question that underlies this most critical reality of these modern times upon which the fate of humankind precariously hinges. Nader and other likeminded pundits tirelessly seek to call attention to the simple fact that when reference is normally made about “climate change”, it has more to do with local, variable meteorological conditions or cyclical changes of the seasons, from winter to spring and summer to fall. Yet too many other dissemblers and hypocrites in the field of politics, industry, science, academia and mass media otherwise seek to disguise or conceal their real intentions that have more to do with the calamitous human and planetary dilemma, to which they are willing parties for whatever their own self-serving ends. By repeating in the world’s ears – 24/7/365 – the phrase “climate change this or climate change that” they seek to simultaneously brainwash and distract the public’s attention from the simple truth that what all the actions are that they are taking amounts to nothing more nor less than Climate Crisis or, worse yet, Climate & Human Devastation. 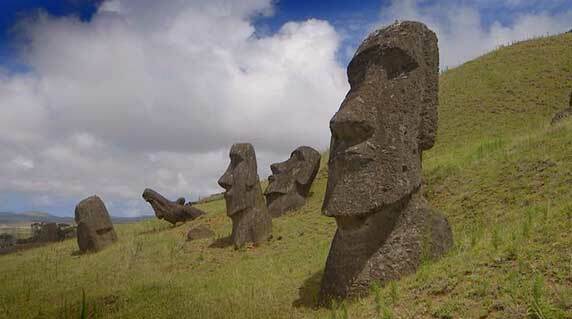 More to the point, it exacerbates a perennial Easter Island Dilemma that all of humanity and modern civilization faces in common, caused by the grossly imbalanced greed of unchecked human behaviour. So here is a suggested new resolution for the entire human race in 2019. From this point forward, every time another dissembling politico, corporate CEO, know-it-all academic or news anchor talking head uses the brainwashing expression “climate change”, all we citizens of the earth will immediately call, write, or tweet our protest to whomever about what is behind all the brainwashing. Perhaps with such a New Year’s Resolution we, collectively, will be able to start to minimize in 2019 and beyond the impending tragedy and calamity that is being perpetrated against us all as One People, One Race, One Planet. This is far more that a Climate Crisis. It is a Biosphere Crisis.